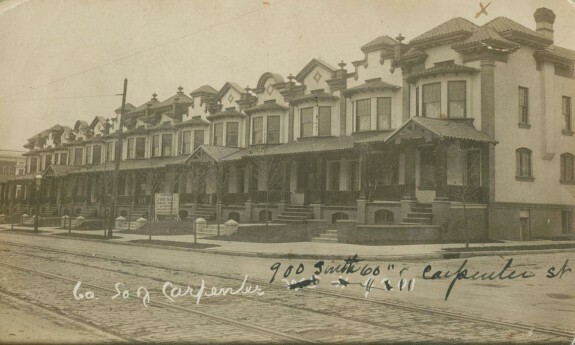 One of the earliest planned streetcar suburbs was Woodland Terrace in West Philadelphia. It was designed by William Sloan in 1861 and prohibited certain disruptive businesses from operating nearby, thus preserving its peaceful residential atmosphere. Woodland Terrace extends between Baltimore and Woodland Avenues near Fortieth Street. Many of the original houses designed by Sloan, who also built nearby Hamilton Terrace, still stand. The neighborhood was added to the National Register of Historic Places in 1972. Peter A.B. Widener began investing in Philadelphia’s streetcar companies in the late nineteenth century. He eventually came to control all of Philadelphia’s streetcars along with his friend and partner William L. Elkins. Widener came from humble beginnings and worked as a butcher. He amassed great fortune through his streetcar investments and founded Philadelphia Traction Company, which later expanded into other cities. 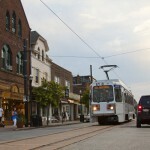 Some of his streetcar lines continue to operate in the city as part of the Southeastern Pennsylvania Transportation Authority's public transportation network. 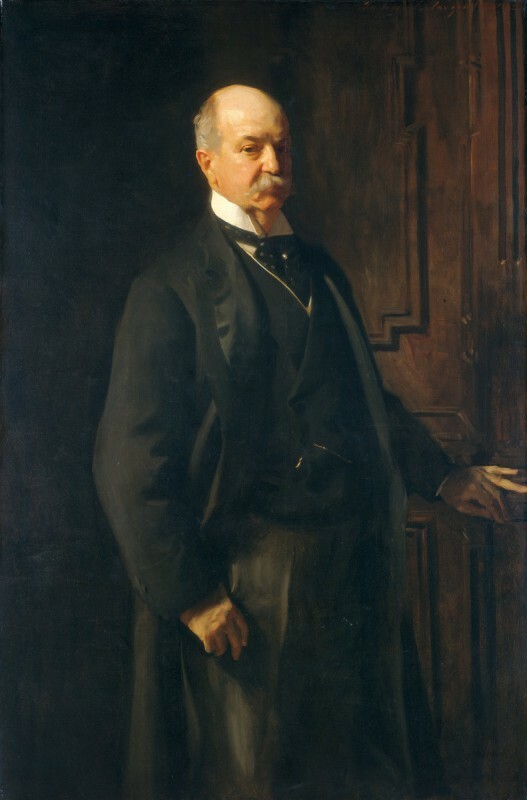 Widener's fortune expanded as he made investments in U.S. Steel and Standard Oil, and he eventually became one of the wealthiest men in America. He continued to live in Philadelphia and the nearby streetcar suburb of Elkins Park until his death in 1915. West Philadelphia grew rapidly from the 1890s to the 1910s as new residential neighborhoods grew along expanding streetcar lines. This row of homes, as seen around 1905, was located on Sixtieth Street near Carpenter Street. Streetcar tracks are visible in the foreground. In some streetcar suburbs, large single-family homes like these were carved into smaller apartment units in the twentieth century. This was a response to the wealthy families who could afford private transportation moving farther outside of the city and beyond the streetcar lines. Families who remained in these neighborhoods were often poor and could not afford the extravagant homes left behind. 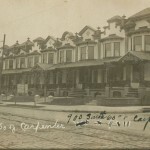 This row of houses in the Queen Anne style stood on Spruce Street in West Philadelphia. Suburbs like these became popular as streetcars allowed wealthy Philadelphians to move farther outside the city and still commute in for work daily. Streetcars remained restrictively expensive for poorer residents, ensuring relatively homogeneous suburban communities, until their electrification in the 1892. This, along with the construction of the Market Street Elevated train, allowed some of the more well-to-do immigrants to begin migrating out into the suburbs from Philadelphia’s congested industrial neighborhoods. 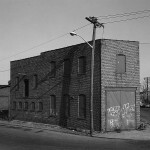 This building in Camden, New Jersey, was the last vestige of the city’s once-thriving streetcar system. 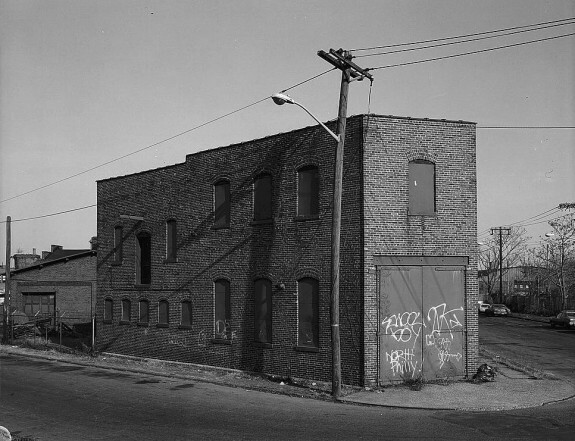 This image from 1968, long after the Public Service Railway streetcars stopped running, shows the building was already derelict. In the decades prior, Camden’s numerous industrial jobs turned the city into a hub for streetcar suburbs. The streetcar lines radiated from Camden’s industrial center into new suburbs such as Haddonfield and Collingswood. Most of these lines were closed during the Great Depression or the post-World War II automobile booms. As increasing automobile use allowed people to live further from urban centers, hubs such as Camden declined. Beginning in the middle of the nineteenth century, Philadelphia’s growing streetcar network facilitated the movement of upper and middle class Philadelphians to residential districts outside of the urban core. New streetcar-centric suburban developments combined the allure of pastoral living with fast access to work and commerce in central Philadelphia. In this way, streetcar suburbs represented a paradox: While their chief attraction was their seemingly natural setting, their existence depended on the Philadelphia’s industrialization, which expanded the ranks of the city’s middle class while also making central Philadelphia a less desirable place to live. Previously, most of Philadelphia’s elites had lived in the center of the city, with poorer residents inhabiting the periphery. The mid-nineteenth century influx of working-class immigrants, however, forced well-heeled Philadelphians to rethink that arrangement. The arrival of Irish and German immigrants led to overcrowding, crime, disease, and social unrest; the city was wracked by anti-Catholic riots during the 1840s. For the middle classes, moving to the city’s fringes provided a buffer from such disorder—a comfortable distance from what they believed were undesirable nonnative populations. The era of industrialization also changed the middle classes’ perception of the city. As the industrializing city grew increasingly packed and polluted, there arose a newfound appreciation for picturesque natural landscapes. For those who worked in the commercial heart of the city, the rural fringe promised a refuge—a private residential sphere for the bourgeois family. In the 1840s, influential landscape architect and author Andrew Jackson Downing (1815-52) popularized the connection between country houses and moral behavior among his middle-class readership. While elites had long built manors in Philadelphia’s rural hinterland, after the Civil War the middle class—factory managers and businessmen who worked in finance or retail—now aspired to spacious pastoral housing of their own. That said, the suburban lifestyle would have been impossible without the advent of an efficient means to transport the middle class to and from the central city. While horse-drawn omnibuses operated from the 1830s, they were slow and inefficient. At mid-century, Philadelphia remained a “walking city.” In 1850, the average worker lived within six-tenths of a mile of his or her job. By the late 1850s, however, the advent of faster horse-powered streetcars running on rails greatly increased the distance commuters were able to travel. Too expensive for the working classes to afford, streetcar ridership was restricted to the growing ranks of middle-class commuters. As they extended their tendrils outward, streetcar lines made possible the creation of class-segregated residential districts at the urban fringe. In the 1850s, speculators began to erect suburban-style housing for middle-class buyers in West Philadelphia—which, as of 1854, had been consolidated into Philadelphia proper. Early developers sought to emulate the style of the elite country houses that already dotted the area. 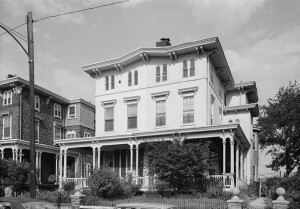 Hamilton Terrace, a row of Gothic Revival and Italianate twin houses on South Forty-First Street between Baltimore and Chester Avenues, was one of the first developments. Architect Samuel Sloan (1815-84) gave Hamilton Terrace features that evoked upper-class country homes: front and rear lawns, porches, and ample tree cover. Sloan also designed nearby Woodland Terrace, a development of semidetached houses built in 1861. Woodland Terrace’s charter protected its character as a residential refuge, mandating that “no slaughterhouse, skin dressing house or engine house, blacksmith shop or carpenter shop, glue, soap, candle or starch manufactory or any other offensive occupation be erected” in the area. Development accelerated as streetcar operators joined in the speculative real estate market. In the 1880s, investors Peter A. B. Widener (1834-1915) and William Elkins (1832-1903) joined forces to consolidate control over the city’s street railway franchises. Their Philadelphia Traction Company ran new lines along the path of their property holdings, enabling them to capitalize by building new suburban-style developments. In the 1890s, they laid trolley lines on Springfield and Chester Avenues, sparking new construction in the Squirrel Hill and Kingsessing neighborhoods in Southwest Philadelphia. West Philadelphia grew denser as builders synthesized the country-house style with the density of urban row houses. While they retained their front porches and lawns, they began to build attached rows of Queen Anne and Colonial Revival-style houses in neighborhoods like Cedar Park. Developers advertised their communities’ urban-style amenities—sewers, gas lines, and, later, electricity—along with their pastoral setting. As housing became denser and more affordable, the population of West Philadelphia swelled from under 24,000 in 1860 to about 200,000 in 1910. 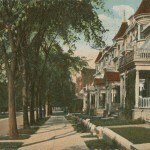 By the 1890s, development pushed past Forty-Second Street. Commercial corridors sprang up to serve these farther-flung suburban areas. Shops soon dotted stretches of Lancaster Avenue, Fifty-Second, and Sixtieth Streets in West Philadelphia. Streetcar ridership flourished as more people moved farther from the city center: 99 million passengers rode the Philadelphia streetcars annually by 1880. As the areas around Philadelphia and Camden developed, streetcar-led construction extended farther from their city centers. 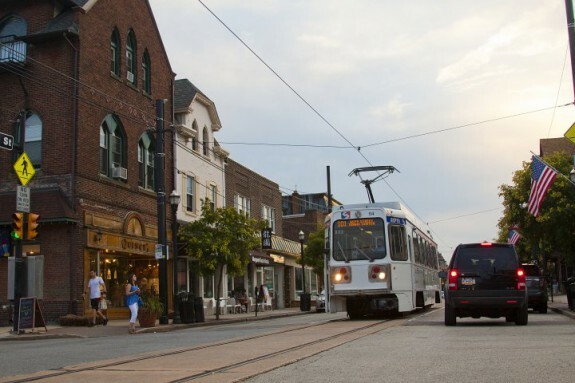 Streetcars linked growing communities in Delaware County—Lansdowne, Media, Collingdale, Glenolden, and Sharon Hill—to the urban streetcar network via a hub in Darby. Montgomery County’s expanding network of suburban streetcar lines converged in Norristown, northwest of Philadelphia along the Schuylkill River. In southern New Jersey, streetcar routes radiated out from Camden’s industrializing core. By the early 1900s, new lines eased travel between Camden and the nearby suburbs of Merchantville, Collingswood, and Haddonfield, complementing their existing railroad links to Philadelphia. Well-heeled buyers moved out to suburban Chestnut Hill in Philadelphia’s northwest, commuting downtown via the Germantown Avenue streetcar (and multiple railroad lines). To ensure that Chestnut Hill would remain uniformly white and middle class, area developers employed restrictive covenants that barred industrial or commercial uses, along with black and Jewish residents. Residents included the renowned father of scientific management, Frederick W. Taylor (1856-1915), who conducted his time-efficiency studies at North Philadelphia’s Midvale Steel plant. At the start of the twentieth century, non-elites began to move out to suburban districts within (and eventually outside) of city limits. Electrification of the city’s streetcars in 1892 and completion of the Market Street Elevated line in 1907 lowered transit costs, making it possible for some workers and upwardly-mobile immigrants to afford a daily commute. In West Philadelphia, the demand for housing led to the construction of four- and five-story apartment buildings in areas formerly devoted to single-family homes; it also sparked development in the outlying neighborhoods of Wynnewood and Overbrook. In North Philadelphia, developers built homes in Olney and Oak Lane to accommodate the growing ranks of successful Germans and Irish (and later Jews) who sought refuge from central Philadelphia’s industrial neighborhoods. Across the river in southern New Jersey, streetcar electrification lowered the costs of commuting into Camden, allowing shopkeepers and clerical works to move to nearby towns. Developers’ advertisements enticed former immigrants to move to neighborhoods like Strawberry Mansion, an enclave on the edge of Fairmount Park. One broker’s 1913 Yiddish-language ad for the neighborhood promised residents “fresh air” and a “beautiful country landscape”—the same sort of pastoral features that had originally drawn the middle class to West Philadelphia’s first streetcar suburbs. With the advent of the automobile after World War I, suburban construction no longer needed to follow transit routes. 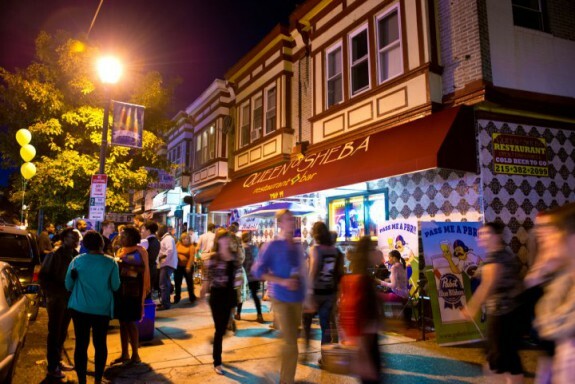 In West Philadelphia, developers began to target areas not serviced by streetcar lines. 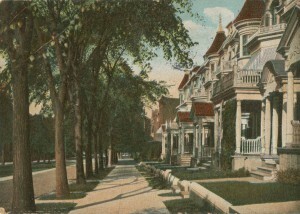 The Garden Court district, built during the 1920s, was among the first to incorporate rear garages on the homes’ basement level. In the following decades—particularly in the years after World War II—auto-centric suburban development exploded in areas outside of Philadelphia’s city limits. Government policies that helped to underwrite automobile suburbs also accelerated the transformation of older streetcar suburbs into lower-class neighborhoods. Middle-class residents of inner suburbs took advantage of favorable government-backed mortgages to buy new houses outside the city. Meanwhile, African Americans migrating to Philadelphia were subject to residential restrictions that pushed them into neighborhoods—Mantua, Parkside, Strawberry Mansion—that the white middle class was abandoning. Landlords took advantage of the situation by dividing historic single-family homes into multiple apartments. Owners failed to invest in upkeep, and many early suburban-style houses began to deteriorate. Federal agencies like the Home Owners’ Loan Corporation hastened disinvestment when they deemed aging and racially-transitioning streetcar suburbs unworthy of mortgage financing. In the final decades of the twentieth century, however, streetcar suburbs began to experience a limited resurgence. 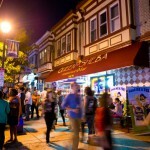 New immigrants flocked to areas like Cedar Park and Upper Darby for their affordable housing and access to jobs downtown. Middle-class returnees were also attracted by the supply of inexpensive historic houses. Streetcar suburbs offered amenities that automobile suburbs lacked: density, walkability, defined commercial corridors, and, most importantly, easy access to public transit. 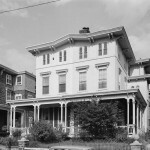 By the beginning of the twenty-first century, middle-class residents filled many of Philadelphia’s earliest streetcar suburbs, and the most architecturally distinctive area of West Philadelphia received designation as a historic district. Once again, streetcar suburbs came to embody the ideal intersection of urban convenience and bucolic refuge. Cammarota, Ann Marie T. Pavements in the Garden: The Suburbanization of Southern New Jersey. Madison: Fairleigh Dickinson Press, 2001. Constosta, David R. Suburb in The City: Chestnut Hill, Philadelphia, 1850-1990. Columbus: Ohio State Univesity Press, 1995. Cutler, III, William W. and Howard Gillette Jr., eds. The Divided City: Social and Spatial Dimensions of Philadelphia, 1800-1975. Westport: Greenwood Press, 1980. Hershberg, Theodore, ed. Philadelphia: Work, Space, Family and Group Experience in the 19th Century. New York: Oxford University Press, 1981. Harold E. Cox Transportation Collection, Historical Society of Pennsylvania, 1300 Locust Street, Philadelphia. John Gibb Smith Jr. Collection, Free Library of Philadelphia, 1901 Vine Street, Philadelphia. Collings Avenue, Collingswood, New Jersey. I faintly remember street cars in Levittown Pa in the early to mid 1960s. Maybe on New falls Rd near 5 points?